You can learn more about rhythm and the real Keith Richards from the first 10 seconds of Start Me Up than from volumes of chord books. Start Me Up is one of the ultimate groove tunes in rock history with one of the most memorable guitar hooks of all time. A definitive track from the modern Stones era, it reached No. 2 as a hit single in 1981, and con­tains one of the most essential Keith riffs in the band’s entire catalog – and there are many in that 30-year-old catalog. Interestingly, it began life with a reggae feel, was recorded and dis­carded, and remained in the vault for a couple of years until the Stones revisited the piece for the Tattoo You album. In its straight-ahead rock rendering, it more than made it – it defined the Rolling Stones of the 80s, ensuring their status as the “World’s Greatest Rock ‘n’ Roll Band” with a new generation. This rhythm guitar masterpiece is a must-know song in any self-respecting rock guitar player’s repertoire. Make that any self-respecting gui­tar player, period. Start Me Up is a perfect example of Keith’s famed five-string open G major tuning (Gtr. 1). If you want to play this song authenti­cally, begin by removing your 6th string. This is optional for players out there with floating whammy bars – in that case, removing a string can wreak havoc with your bridge balance and may feel very weird. Next, lower the 5th string a whole step to G and the 1st string a whole step to D. The 4th, 3rd, and 2nd strings remain the same as in standard tuning. If you have chosen to keep the 6th string on, make sure to avoid it when strumming – this is ungainly and no doubt why Keith removes it in the first place. Also, you may want to tune the 6th down to D to stay in open G tuning on the guitar. Gtr. 2, presum­ably on Wood’s part, is in standard tuning. The main riff (Gtr. 1) propels the tune and is heard throughout in the intro, vers­es, at the end of choruses, and in the outro. It has all the right stuff – the patented I to IV moves, a strutting rhythm feel and even an affectionate nod to Chuck Berry in the Bb5-Bb6 comp-ing of the figure. The nucleus of the riff is the I to IV move of C to Fsus2/C. The more complex Fsus2/C for the IV chord is a natural by-product of the open tuning. The notes automatically occur when forming the simple guitar chord shape which would normally be a plain F major [Fig. 1]. In Rhy. Fig. 1, and other variants of the main riff, Keith applies his trademark hammer-on chord technique to the two shapes, C and Fsus2/C. While these are not always slurred, the principle is the same. Keep your index finger barred down for both chords – the C chord will be a single-finger barre and the Fsus2/C simply adds the third and second fingers to that already barred shape [Fig. 2]. This familiar move is one of the most common in rock rhythm play-ing and riff making – applied by practically every guitarist in the genre from Keith, Jimmy Page, and Pete Townshend to Ace Frehley and Van Halen (see Ain’t talkin’ ’bout love guitar tabs by Van Halen) . A similar barre concept is used for the Bb5-Bb6 comping figure in the riff. Here, the chord shapes contain only three notes [Fig. 3]. In Rhy. Fig. 2, Keith slurs power chords for a quasi-slide guitar impression. The tuning makes these three-note root-5th-root shape-easier to finger and execute with single-digit barre shapes [Fig. 4]. In the second verse and outro, Gtr. 2 (Ron Wood) adds tasty rock ‘n’ roll fills to the arrangement. In the second verse, these act as contrapuntal “answer licks” and play off the vocal spaces, enhance Keith’s riff, and produce that classic Stones guitar interaction. Notice he plays an abbreviated form of the main riff as a I to IV triad fill in measures 5 and 9 of the sec­tion, and uses a hammer-on/pull-off articula­tion which mirrors Keith’s phrasing. Gtr. 2 has a quirky chorused effect which colors the tone nicely and sets it apart from the dominant rhythm part. In the outro, Gtr. 2 plays rootsy rock double-stop and single-note fills in the fourth position F minor pentatonic (F-Ab-Bb-C Eb), sixth position F major pentatonic (F-G-A-C-D), and in the F minor pentatonic blues “box” shape at the first position. 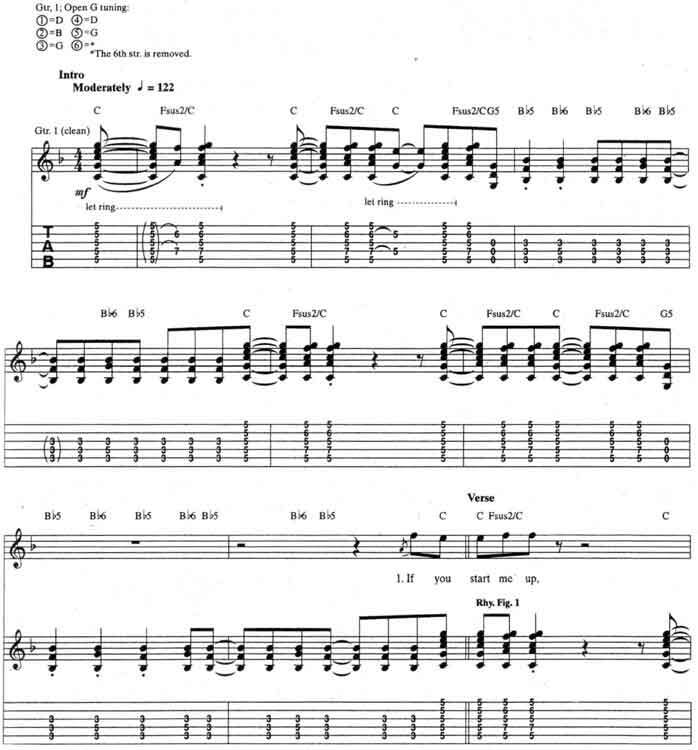 It’s a part of The Rolling Stones Start Me Up guitar tab and sheet. © 2012 - 2019 TabsClub Powered by TabsClub 42 queries in 0.292 seconds.